This is a wine glass with bucket bowl on inverted baluster and base knop, with folded foot.English Baluster Wines are a group of the most beautifully and well designed glasses ever made. This light green glass cantir is from Catalonia, Spain. A cantir is a type of closed jug or cantaro with a ring handle and two spouts. It is a type of pass glass with the slender spout used for drinking by pouring the liquid directly into the user’s mouth. This pocket tumbler is a glass which was carried by a traveler in a pouch or pocket. This tumbler was blown and flattened to an oval shape then decorated with a chain trailing pattern. A large number of pocket tumblers were made in Spain from the early-17th though the late-18th century. 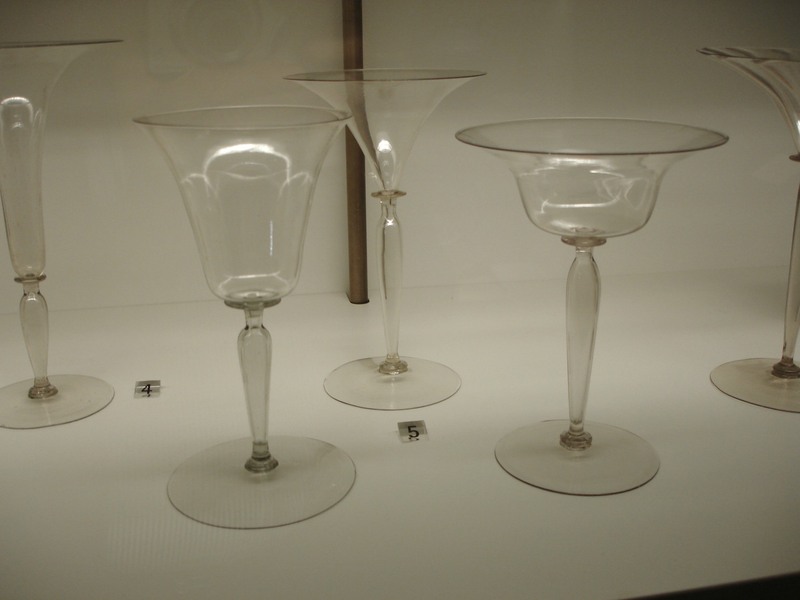 The origin and date of this glass is unknown because no parallels could be found. This graceful bottle is completely covered with a shimmering iridescence. Cylindrical bottles of this period are characterized by two types of mouth: one folded in and flattened and the other more common funnel mouth with folded rim as in this example. Both types of bottles are consistently a pale green. Piece is intact. Found in Turkey. 04R Roman cylindrical bottle with iridescence. This pale olive green bottle has a funnel-shaped mouth and two handles of a darker green color. The faint diagonal pattern on the body was achieved by first blowing the glass into an optic mold. The bubble was then removed, twisted and further inflated. The small hole created by the neck constriction in this vessel permits only a drop or two of liquid to pass through at a time. This also prevents the costly contents from evaporating. The glass is still fairly clear and transparent as it was originally intended when created. Flask is intact. It was found in Israel. Dimensions: H = 19 cm. ; ø rim = 8,1 cm. ; ø foot = 8,4 cm. ; weight = 73,9 gram. 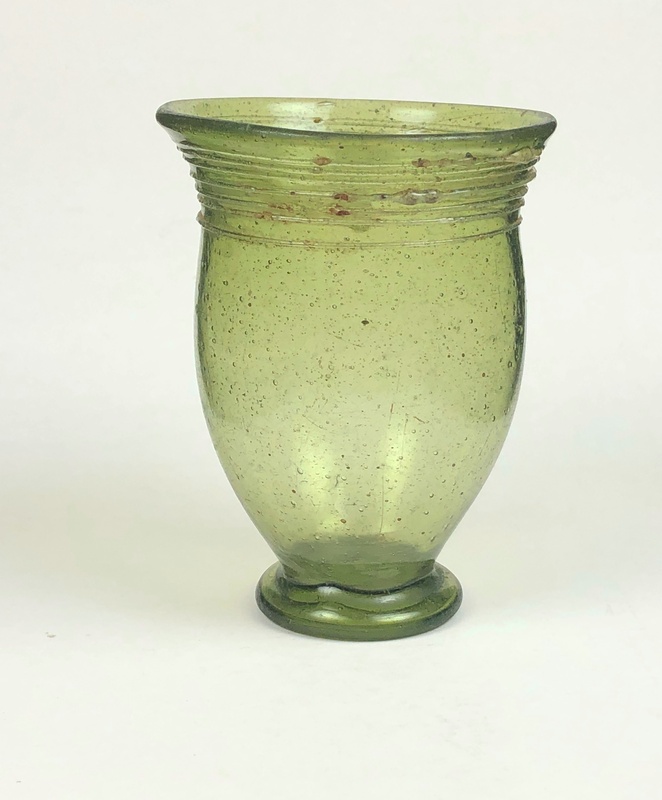 Origin & Date: This glass is most probably a Tuscan wine glass, first half 17th century ~ 1625. Stem Type: This is a so called stem “a tige” or like a twig with an merese connecting stem to foot. Description: The bowl is directly set to the hollow stem which is connected by a merese to the rather flat foot. The glass has a faint somewhat smokey color. The glass is similar to #93 (Example 16) except for color, connecting merese, origin and date. Origin & Date: Venice last Q 16th century. Description: The bell shaped bowl is set via a merese directly under the bowl to the hollow stem “a jambe”, being directly set via a merese to the almost flat foot. A simple and most elegant stem architecture. Remark: This glass like # 93 and # 117 is sometimes called a “flying glass”, as the person taking the glass is fooled by the light weight. The glass “flies” as it were as the senses are set for a much higher weight and subsequently the muscles geared to that higher weight have a funny experience from the shear light weight of the glass. Dimensions: H = 13,1 cm. ; H stem = 3,5 cm. ; ø bowl = 6,8 cm. ; ø foot = 7,1 cm. ; weight = 66 gram.